We have marked a distinct and dynamic position in the market by providing a high quality array of Tamarind Puree. Tamarind is the brown, tart flesh from the pods. The flesh surrounds the brown shiny seeds within the sausage-shaped pod. Pods are harvested at different stages of maturity according to their use. We are the eminent Exporter of the Best quality of Tamarind Paste to our clients. - High quality glass jars. Our goodwill in this industry can profoundly be attributed to our range of Tamarind Paste from our exclusive assortment of paste. The offered paste is widely admired by our clients for its rich flavor and taste. Our paste is processed by our professionals using termarind, appropriate ingredients and fine grade spices. Make the delicious tamarind (imli) rice with peanuts in the authentic South Indian flavour, tangy and spicy.Tasty rice meal in minutes! 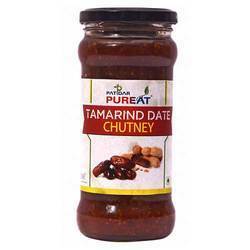 Savour your favourite snacks with the tang of tamarind and sweetness of date with this chutney. Produced, Processed and Packed using Safe, Chemical Free Practices. Assures Good Health right through the Soil, Seed, Yield to the Food. Organic certified Tamarind Paste or Imli for export or domestic market. This organic product is produced by the farmer communities of Odisha, and is supported by NGOs working in the sector of sustainable agriculture. Our company holds vast experience in this domain and is involved in offering Tamarind Paste. To cater the variegated demands of our clients, we are highly engrossed in offering a wide range of Tamarind Paste. The fruit of a tropical tree, tamarind is an indispensable spice in most south Indian kitchens. Today, India is the only producer of tamarind on a commercial scale. A large part of India's production of tamarind is exported to West Asia, Europe and America, where it is used in such food specialities like Worcestershire sauce.